For a friend's birthday we decided to try out BrenArt, a wine bar in Pasadena. 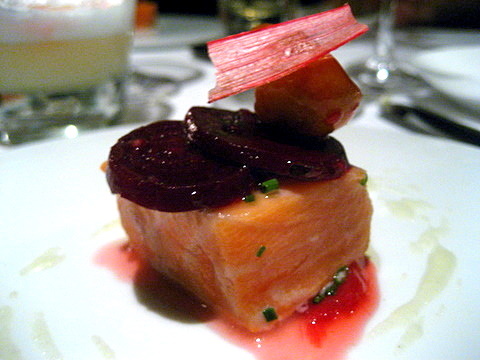 The restaurant places a heavy emphasis on food, serving "French-European cusine with a touch of Asian influence". The chef, Yi-Fan Chu studied at the California School of Culinary Arts and worked in a Michelin starred restaurant in Germany before recently taking the helm at BrenArt. 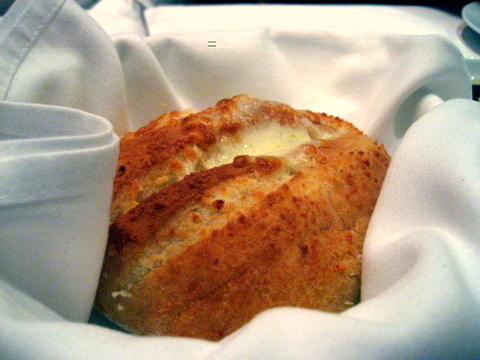 The bread came out piping hot and stuffed with a bit of cheese. A very straightforward presentation but still quite satisfying. I was expecting the escargot to be integrated into the pastry. As it was, the dish was clumsy and difficult to enjoy properly. 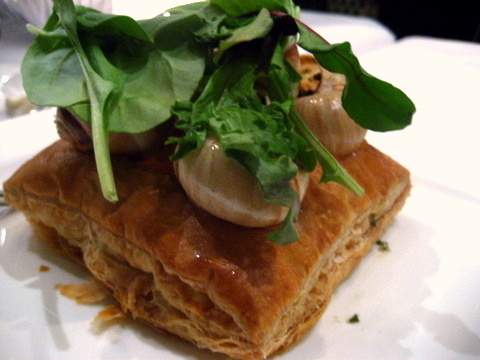 There was a great deal of labor involved in shelling the escargot and cutting a proper sized piece of the puff pastry. For best effect, the snails should be taken out of the shell and served each on their own bite of pastry. 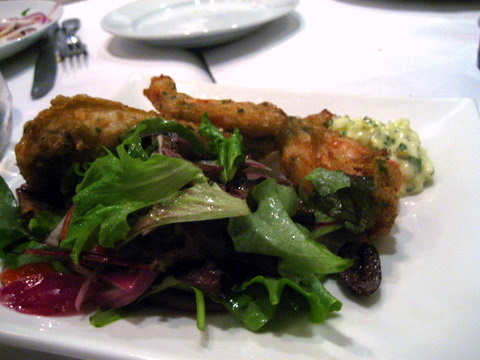 The frog legs were easily the largest I ever had and on the tough side. I typically favor sparing use of sauce but this dish definitely needed more as the leg was very lightly seasoned and didn't taste like much by themselves. 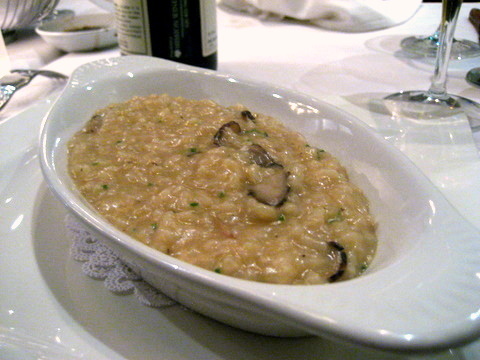 The risotto was done using a short grain rice similar to sushi rice. Short grain rice tends to have more amylopectin than the medium grained rices typically used for risotto. Amylopectin is one of the two starches in rice and tends to gelatinizes when cooked. The effect was an overly sticky soft almost mushy risotto. Probably the best of the entrees. 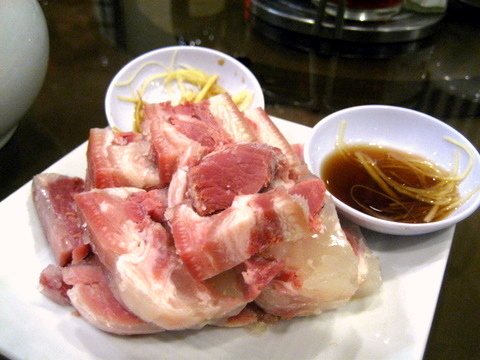 The pork belly had a nice balance of fat and lean meat giving everything a nice richness. 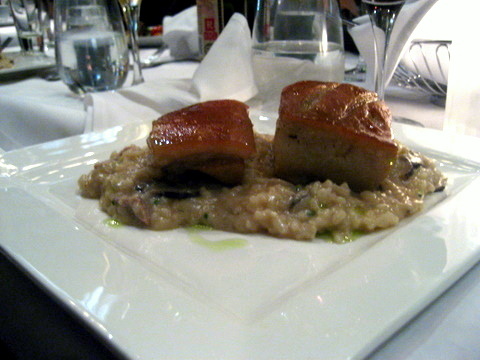 The risotto was similar to the mushroom risotto above. 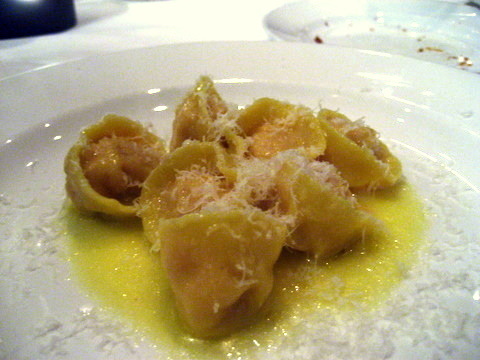 I didn't detect any of the aforementioned white truffle, but that didn't really detract from the flavor of the dish. 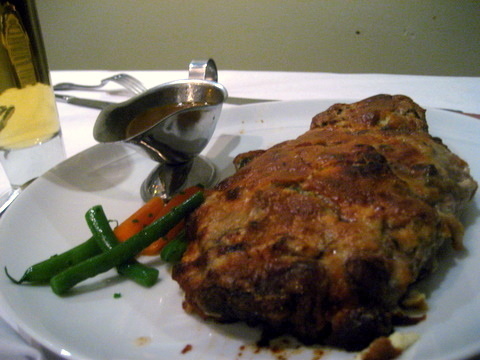 The meat came virtually encrusted in mushrooms, onion and cheese which dominated any natural flavor the beef might have had. I didn't mind the gratin or the onions but I would have liked to taste more of the meat. Texturally the steak was a bit tough for my tastes surprising given that this was a rib eye. The worst course of the night. 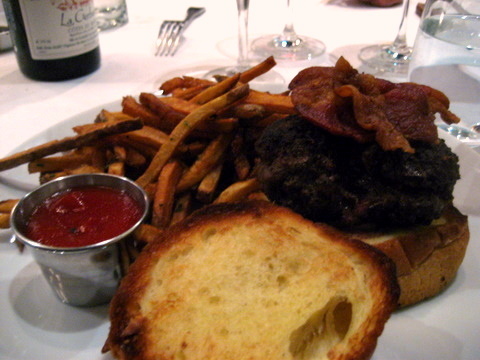 The burger sounded good on the menu but when it arrived, there was no lettuce, tomato, or onion. I asked a waitress to bring the condiments but with 20+ people in the party my request must have gotten lost in the shuffle. After waiting 15 minutes I proceeded to try what was probably the worst burger I have ever tasted. The meat and bacon were both horribly dry and burnt, without any vegetables to provide some liquid I could barely even get a bite down. I sense the restaurant has yet to find its place. The menu has some interesting courses but the execution needs more work. I imagine part of the lackluster experience stemmed from the fact that we had an especially large party. Given some time the restaurant might be able to establish a niche for itself. Sadly the current economic climate doesn't allow for that kind of generous learning curve. 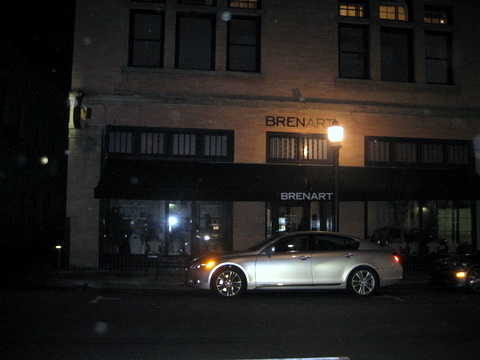 I read that BrenArt had closed since my visit and Chef Yi-Fan had moved on. I tried calling the restaurant and the line was disconnected. Farewell BrenArt we hardly knew ye. 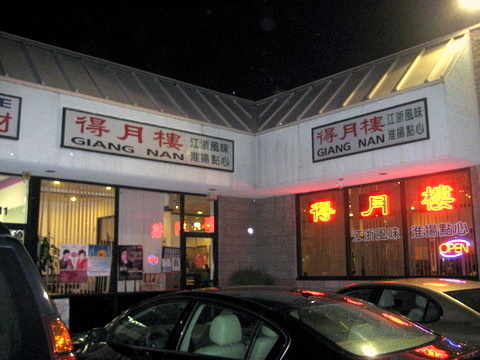 Giang Nan is an authentic Shanghainese restaurant located in one of the many strip malls dotting the San Gabriel Valley. My friends and I often looked for an authentic Chinese restaurant that paired appropriate wine with the food. Failing to find any such restaurant it took the initiative of the FoodDigger folks to finally make this pairing happen. 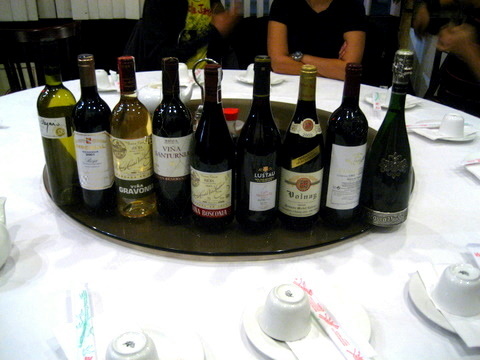 The theme of the latest FoodDigger dinner was Chinese food with Spanish wine. The majority of the wine were Spanish reds, which make sense given the heavy flavor of the dishes being served. Kevin brought a couple bottles of white to change things up a bit. The wine pairings seemed very well thought out and more often than not complimented the dishes they were paired with. The FoodDigger crew must have put in a good amount of time and effort determining which pairings worked. 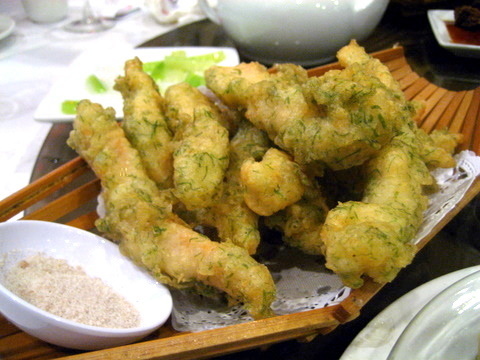 The fish had a salty/sweet flavor and a dry texture some people felt was reminiscent of eel. 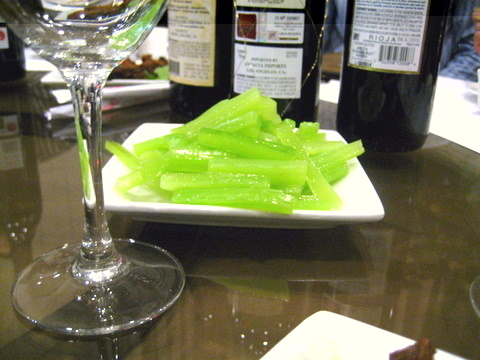 It might have been an effective snacking food with wine but I found it a little too lean for my tastes. I am a huge fan of pork served with the layers of skin and fat. This was a surprisingly balanced with the different layers providing subtle textural contrasts rather than variations in flavor. Taken alone this was a bit bland, with neither ingredient having much flavor. The course was actually meant to be eaten as a side with the fried yellow fish. The fish was easily one of the best courses of the night. 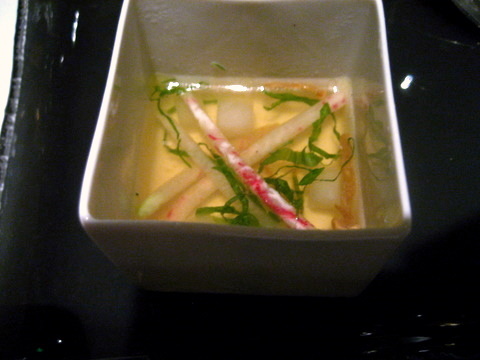 By itself the fish was fairly plain, relying on the seaweed added subtle brine. 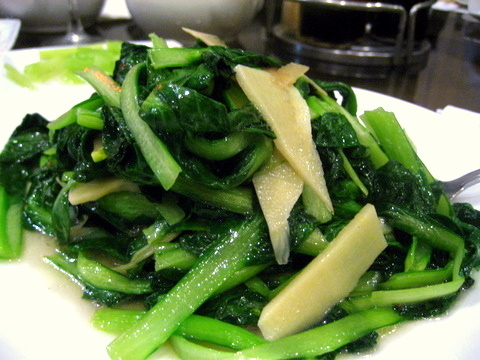 Adding a bit of the jiao yan gave a much appreciated saltiness and a mild peppery kick to the dish. The vegetables were nothing particularly special slightly crunchy with a faint bitterness. My parents have reminded me on many occasions this is considered an expensive vegetable, perhaps as a vain attempt to get me to eat it. I don't really remember this course too well. 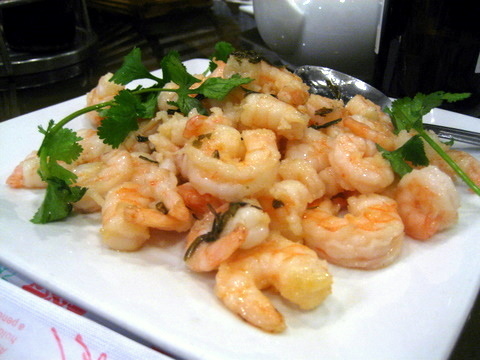 The shrimp itself was decently cooked if a bit bland. 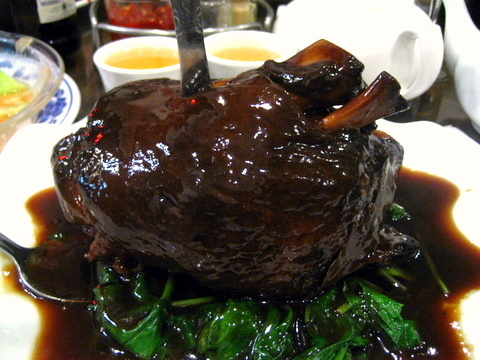 Another specialty of the restaurant, Xi Hu Cu Yu is named after a lake in Hangzhou. 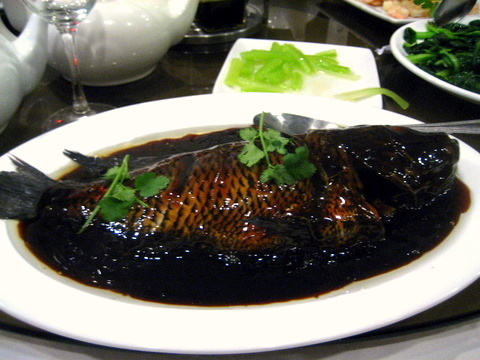 Typically a fish native to the area is used, but I think the restaurant served a tilapia instead. 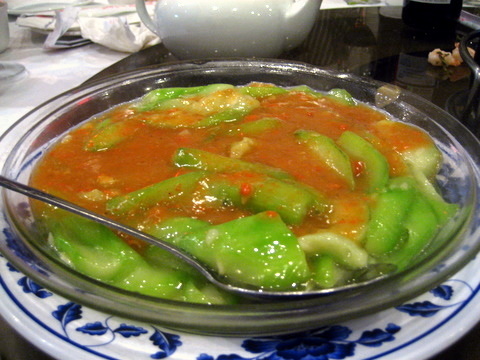 The sauce overly thick and tended to coat everything with pungent sweet/sour flavor. The name of this course literally translates to Lion's Head (Shi Zi Tou). If you use your imagination the meatballs and vegetable might bear some small resemblance to a lion's head. 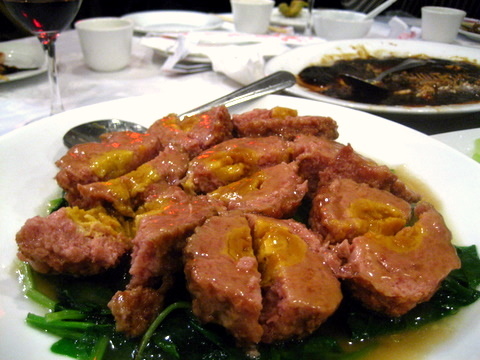 The meatballs are made up of ground pork and stuffed with salted duck egg yolk. 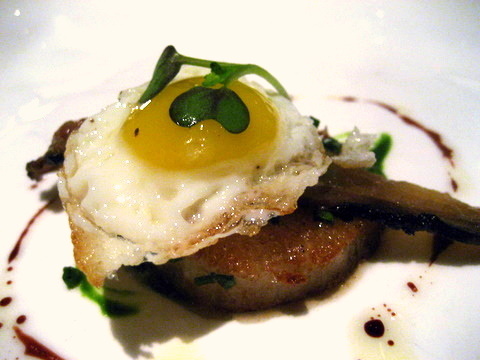 Very simply seasoned, the richness of the meat and saltiness of the yolk dominate. I've had this squash a number of times at home and found it either mildly sweet or bitter and I am not sure what accounts for this difference. Giang Nan's preparation was quite sweet, perhaps the flavor was enhanced by the flavor of the crab. 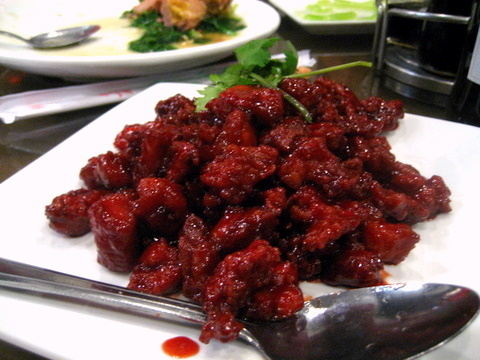 This looked like sweet and sour pork that you could find at any Chinese fast food restaurant. Palatable but a bit over sauced for my tastes. 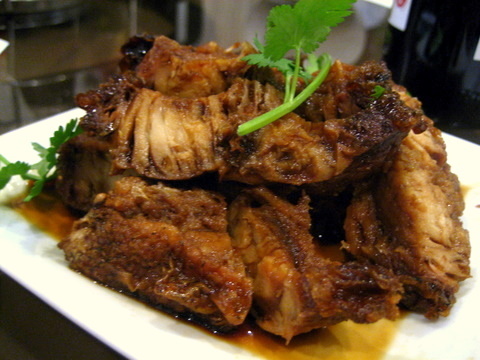 I believe this is actually Ti Pang, a braised preparation of pork that combines gloriously fatty skin with tender flavorful lean meat. As a kid, Ti Pang was always a rarity, a special dish that was only ordered at extended family gatherings. Even then we were always served sparingly since it was so obviously unhealthy. Having it again brought back distant memories of family gatherings in Taiwan. Sadly I missed out on pictures of the next two courses. Like the bean curd and mixed vegetables this course was ordered as a side dish, in this case to temper the artery clogging fat from the Ti Pang. After a night of heavy sauces the restaurant brought out a course that desperately needed some. The rice cake itself was prepared fairly well, quite "Q" and some extra flavor would have made it one of the night's standouts for me. 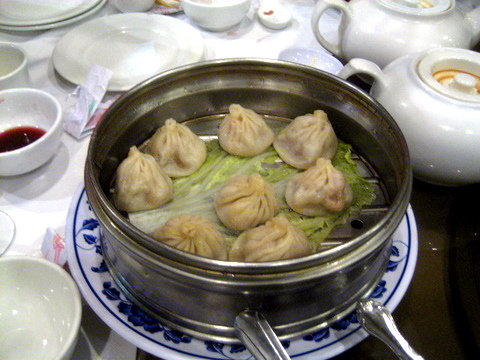 Probably the most well known Shanghainese delicacy simple buns filled with pork and soup. I found these to be a bit dry and lacking the characteristic broth, arguably the most important element in the dish. I have never been a fan of Chinese desserts but this was fairly good. 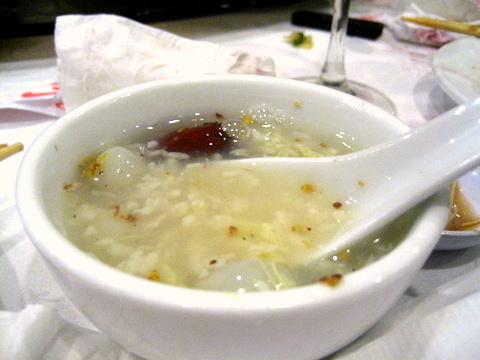 A fairly complex mix including rice, fruit, and Tang Yuan. Giang Nan's food was quite different from Cantonese style cuisine that I normally eat, featuring far more sweet and sour elements and much thicker heavier sauces. The food was fairly authentic although it could be a bit much for those unfamiliar with Shangainese cuisine. For the most part the wine added welcome dimensions to the dishes. Far and away the best part of the meal was the company and experiencing this unique meal with friends who appreciated it as much as I did. Thank you Will, Brian, Marshall, and Eddie. 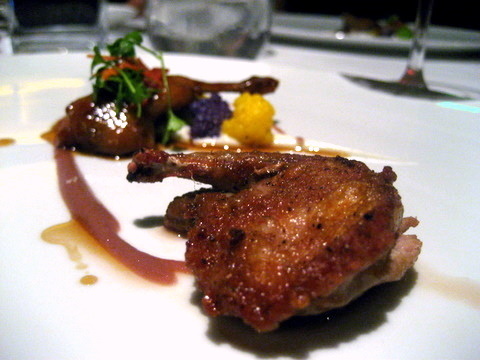 Like the last FoodDigger wine dinner, I wasn't quite satiated. Kevin and I decided to hit up In-N-Out before calling it a night. This was actually the first time I ordered a 4x4 so I decided to take a photo to commemorate the meal. 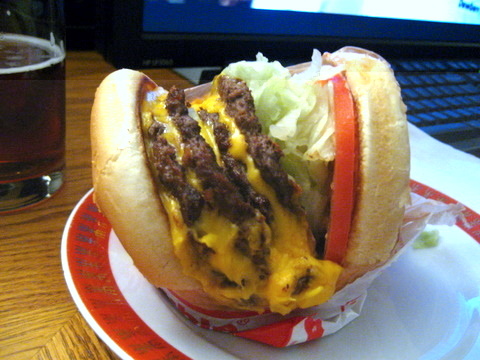 I've heard conflicting reports but supposedly the 4x4 is the largest burger In-N-Out officially makes. Mozza has been one of the most talked about restaurants in recent memory, with celebrity sightings and even a Michelin Star to boot. The restaurant and it's sister, Pizzeria Mozza serve up the Italian cuisine of Nancy Silverton, Mario Batali, and Joseph Bastianich. My friends and I had wanted to try the restaurant but also were a bit put off by celebrity chef and owner Mario Batali's apparent disdain for bloggers. We visited the restaurant on a whim as we were in the area after visiting another longtime dining companion who was recovering from heart surgery and provided the impetus for the previous two dinners, Sushi Zo and Sona. The restaurant is cloaked in drab grey hues and subdued colors, overly somber given the lively atmosphere inside. The entrance leads to a small dining area with a bar in the corner. The mozzarella bar dominates the center of the dining room with more tables and a private dining area in the rear. We had a reservation but still ended up having to wait a few minutes at the bar which should give some idea about the success Mozza is enjoying given the fact we were dining on a Tuesday at 9:00PM. Naturally we decided to start with some cocktails. 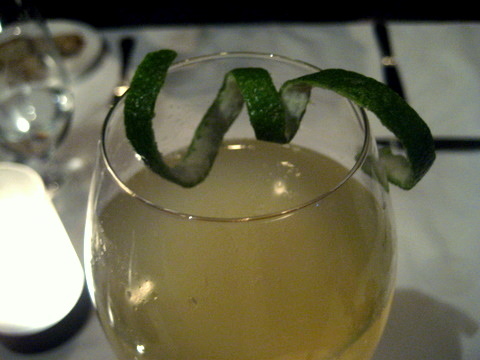 I chose the Gordon's Cup made with gin, Japanese cucumbers, lime and salt. 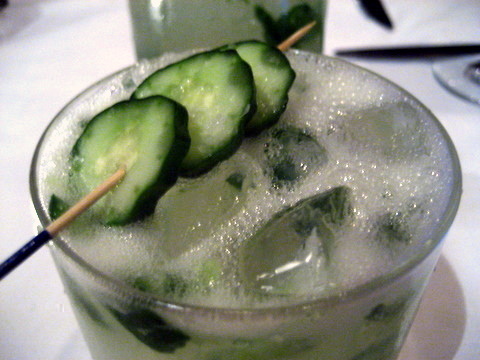 This was reminiscent of my standard cucumber gimlet but the use of Japanese cucumber made this one of the best. 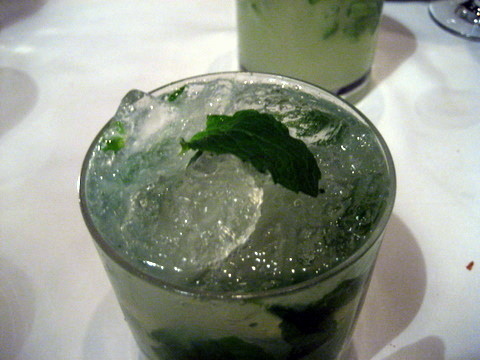 My companions had a Mojito and an Il Postino (champagne cocktail) both quite good but not up to the level of the Gordon's Cup. I found the bread a bit dry and firm. 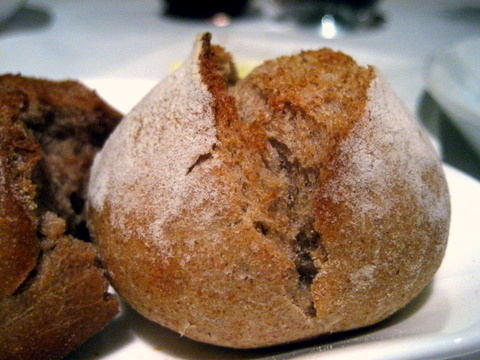 Fairly traditional Italian style bread, served without butter; definitely not my cup of tea. An overly simple amuse for my tastes. The combination of black olive and ricotta offered a bitter slightly sour tang. I would have liked something richer to round out the flavors. 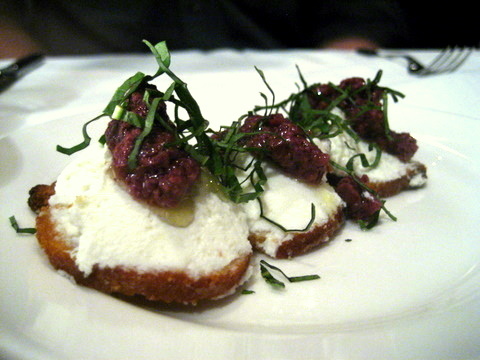 The restaurant offers a staggering array of mozzarella served with diferent accoutrements. 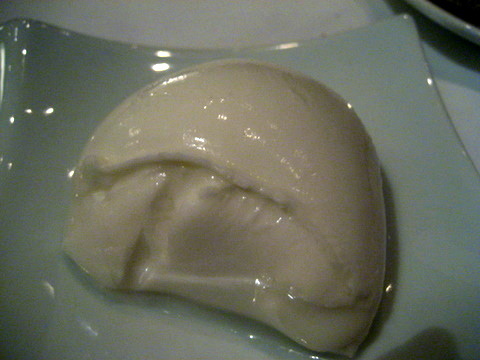 We decided to share a tasting of mozzarella which consists of burrata (mozzarella with fresh cream), standard cow's milk mozzarella, and mozzarella made from buffalo's milk. 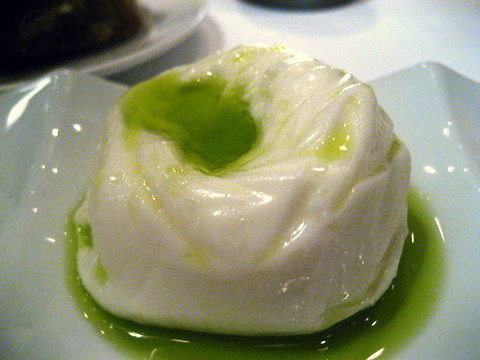 By far my favorite was the bufala mozzarella with a distinctive tart gaminess. 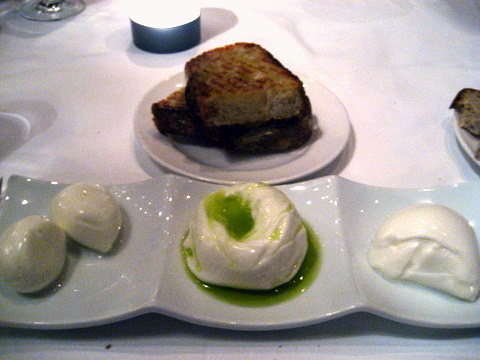 The creamy burrata had a slight sweetness and a richer smoother feel than the others. 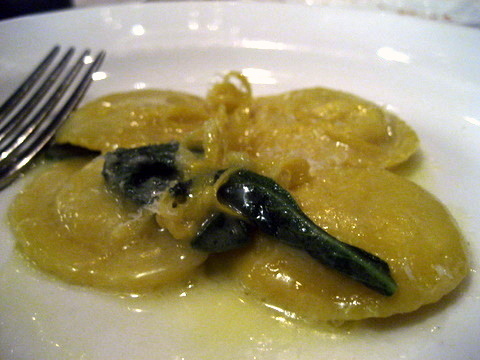 The traditional flor di late had the most elegant name but was the simplest least impressive of the trio. A great start to the meal although we didn't know what the pasta was filled with. 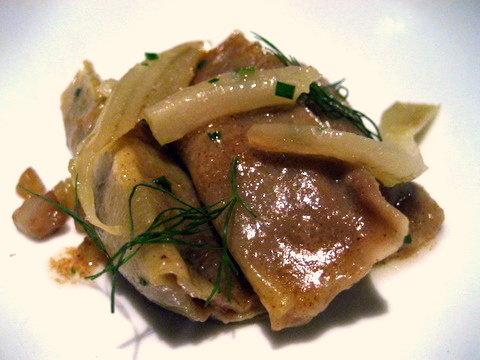 The meat had a sour savory flavor that reminded me of shiu mai dim sum. The sauce added a cheesy element that balanced well with the flavor of the meat. Delicious in its simplicity. Calf brain is always a bit risky but this tasted more like Chinese shao long bao. 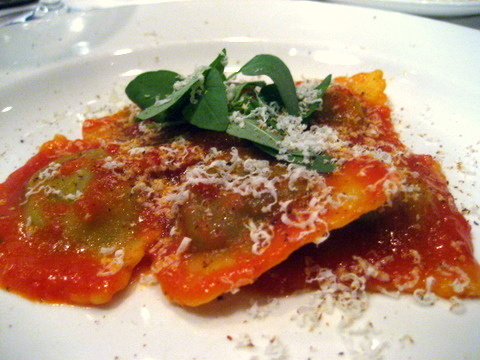 Biting into the ravioli released a burst of liquid that further heightened the similarity. The filling was much firmer than I would have expected for brain, with none of the offensive oiliness. The restaurant offered a number of interesting beers and I decided to try those rather than stick with the traditional wine pairing. 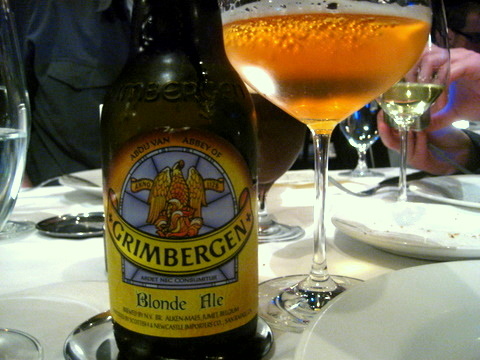 For the first round we had a Grimbergen Blonde and a St. Bernardus Prior 8. 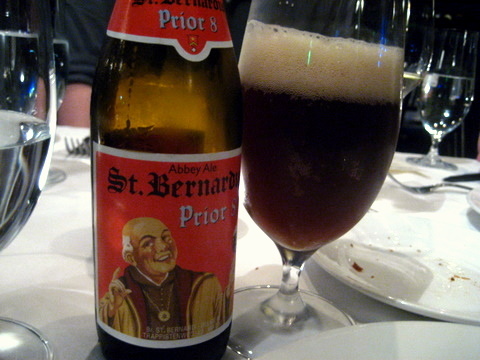 The blonde had a honeyed flavor while the Bernardus was akin to a traditional Trappist ale with lots of richness and dark flavors. Yet another dish reminiscent of traditional Chinese cooking, this time beef noodle soup or niu rou mien. The gnocchi itself was a bit soft and quickly developed a pasty texture, decent but not quite as nuanced as the previous two courses. The braised meat definitely makes itself known in this dish and is complimented nicely by the tangy kick of the tomato sauce. The pasta itself was a bit firm for my tastes but didn't detract from the overall experience. 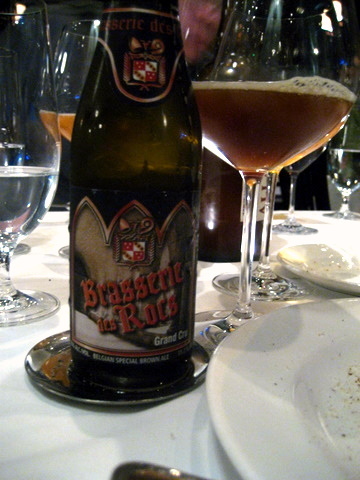 The second round of beer consisted of an Allgash Curieux and Abbaye Des Rocs Grand Cru. Both fairly dark in color. 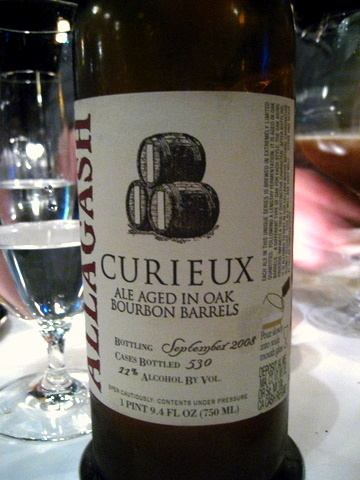 The Allgash was cask aged and showed a surprising complexity and depth of flavor. Meanwhile, the Abbaye had a spicy punch backed up by dark sweet fruit. I thought spaghetti would be too simple for a restaurant of Mozza's reputation. Indeed the noodles were a bit denser and harder than traditional. 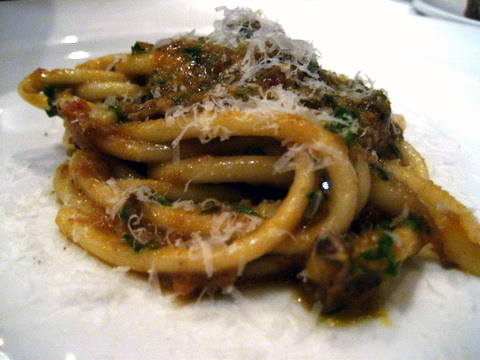 The duck ragú had a fishiness to it reminiscent of Spanish Mackerel making it the heaviest of the courses on the tasting menu and a fine way to finish the savory pastas. 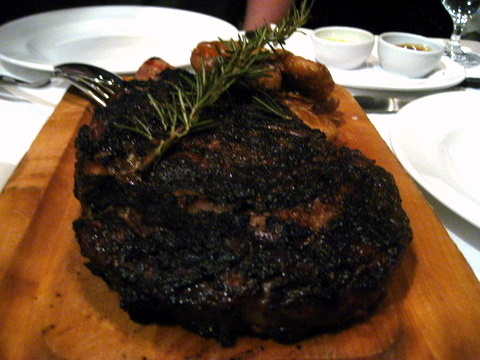 We weren't quite full so we ordered an extra course of rib eye steak to share. The charred mushroom was a bit too bitter and the meat itself was far too tough to be served at a restaurant of this caliber. I was very disappointed as this was far and away the most expensive dish on the menu and only $11 less than the entire tasting menu. 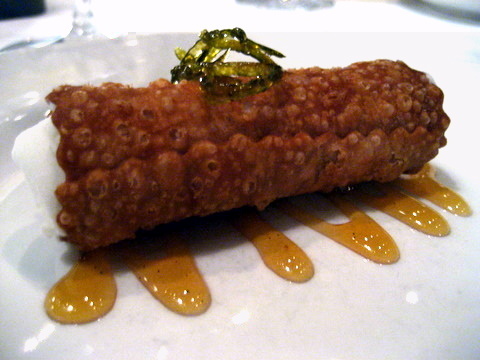 A popular Italian dessert, it is no surprise to find Cannoli on the menu at Mozza. I found this preparation a bit too hard and dry. By itself the gelato would have made a nice palate cleanser but served with the yeasty sweetness of the cannoli it really struck a discordant note. A very dry cake, with intense herbal and lemon flavors. I found this a bit too harsh for a second dessert and would have preferred a chocolate based finale to the meal. Without a doubt the cheese was the star of the evening. 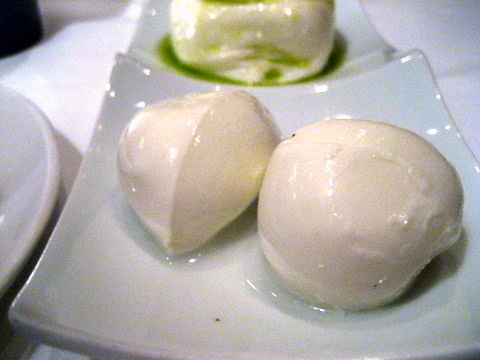 I am a huge fan of mozzarella and these were some of the strongest examples I have tasted. Humorous comparisons to Chinese food aside, the various pasta courses were all fairly well done; each course having enough subtle difference to set them apart. The steak and desserts all missed the mark in some respects. I came away satisfied by the meal although not particularly awed by the food. 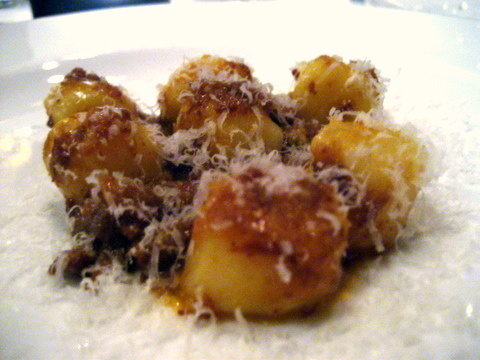 Osteria Mozza offers a successful combination of food and atmosphere with a dose of hype thrown in for good measure. 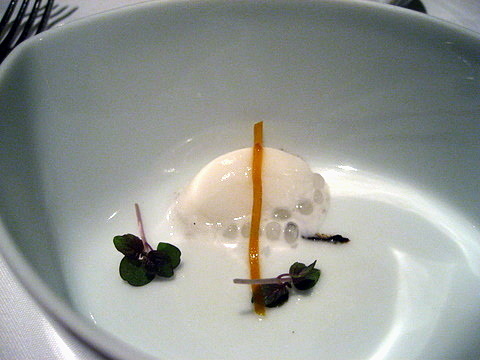 Sona was one of my early forays into fine dining and at the time it was the best tasting menu I had in LA. Since then I have meant to go back but never really found the time. It eventually took a friend having heart surgery to bring us back. As one of his favorite restaurants, he wanted to share a good meal with friends and family in case something happened. Happily he is recovering well and hopefully will be eager to treat us to more meals in the future. The bread selection was surprisingly strong. We started off with black tea and red wine both warm and inviting. The red wine had a slight sweetness reminiscent of preserved fruit while the black tea had a delicate woody aroma. 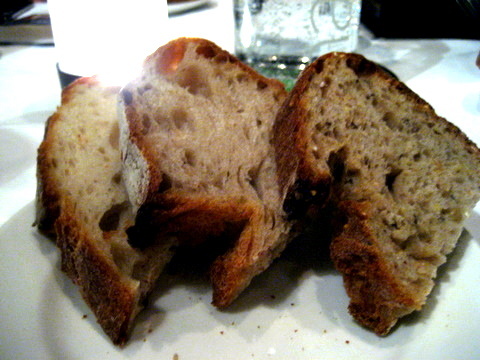 These were followed by a chestnut bread that was nutty and sweet as one would expect. 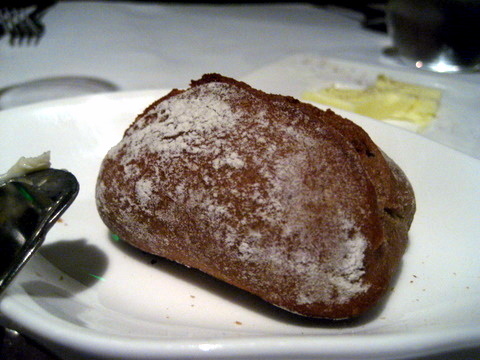 Lastly we were given a wheat bread with a nice rustic flavor. Using ingredients from Japanese cuisine, the interplay between the fragrance of the shiso and the smoky broth teased the palate and made us hungrier for the meal to come. The fish came to the table almost quivering, it was literally hard to tell the salmon was even cooked. The meat had a clean fresh taste and while I enjoyed the sweetness of the beets, I felt the kumquat was far too sour, almost to the point of being bitter. 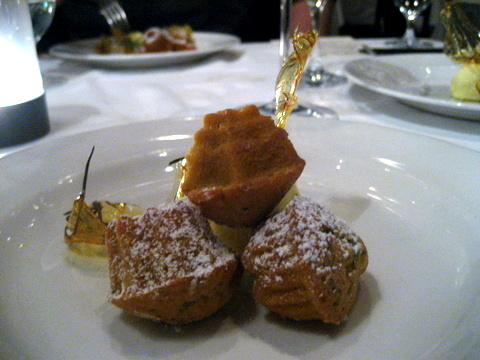 The use of the dense chestnut paste upset the balance of this dish. Overly sweet and blunt, not even the other elements of the dish could save it. Never a big fan of chestnuts, I could have been biased, although the general consensus of the table seemed to echo my sentiments. 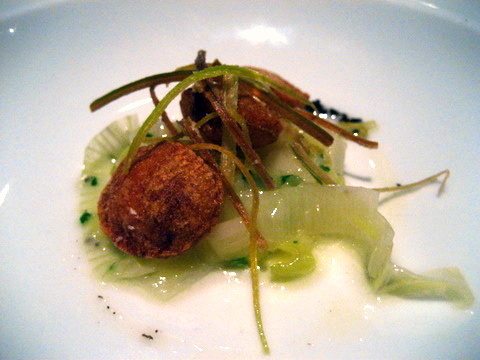 One of the most surprising and best tasting courses of the night was this complex study of the humble potato. 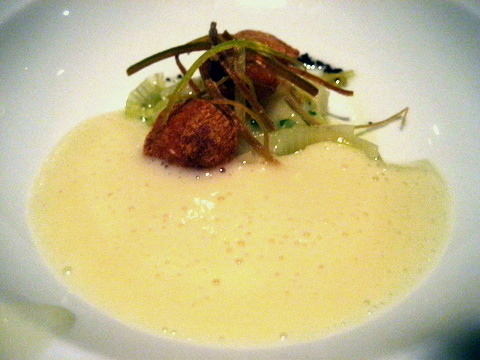 The course entered around very creamy rich soup and the drastically different crunchy Tater Tot-esque pomme soufflé, each highlighting different facets of the main ingredient. 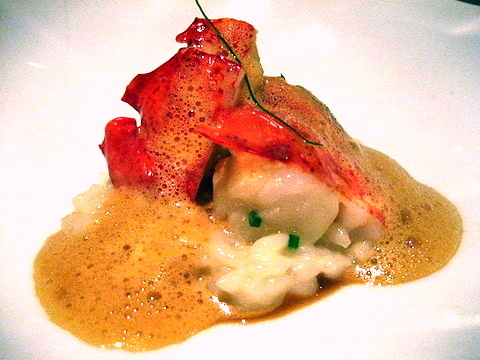 There was nothing wrong per se, but after trying so many different presentations of lobster risotto, each seems to have its own subtle differences that cater to different tastes. For example, Sona's lobster had a nice crunch but also an intense butteriness that verged on cloying. The rice was maybe a touch overcooked for my tastes but others seemed to prefer the texture. Bacon wrapped scallops used to be one of my favorite appetizers when I first started dining out. They have fallen by the wayside since so it was nice to see Sona's take on this classic app. 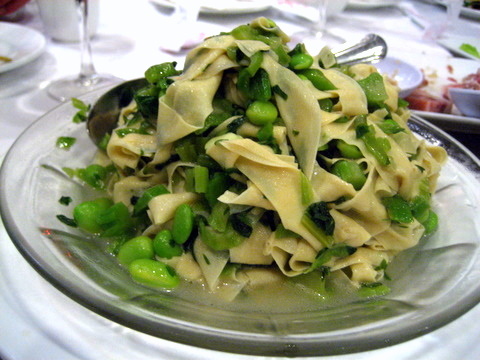 Overall a fairly unpopular dish as most people found it overly salty. On the other hand, I quite enjoyed the combination and the distinct flavor of the lamb bacon. We were served two parts of roasted quail the smaller was rich and oily and tasted strongly of quail while the larger part was spongy and dull. The sauce was far too intense for the bird although the various greens gave a nice crisp bitterness that contrasted with the richness of the bird. 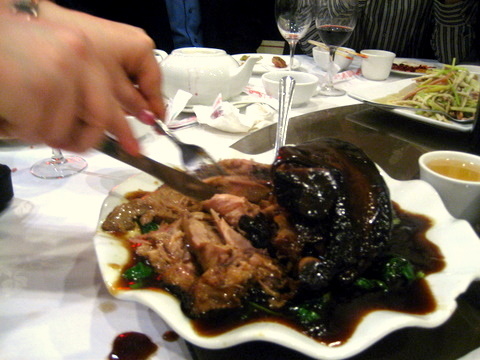 As one would expect the braised veal was extremely soft and tender and had a nice balance between lean meat and fat. 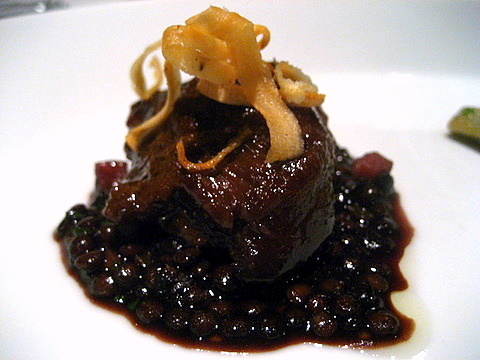 The overall flavor was a bit sour though this flavor was tempered by the slight sweetness of the lentils and artichoke. Another supplemental, the beef was sourced from Gunma Prefecture home to Chef Yagi. The meat itself was fairly lean for A5 Wagyu. Although too much marbling can quickly become overly heavy, given the small portion, I would have liked a bit more unctuousness. 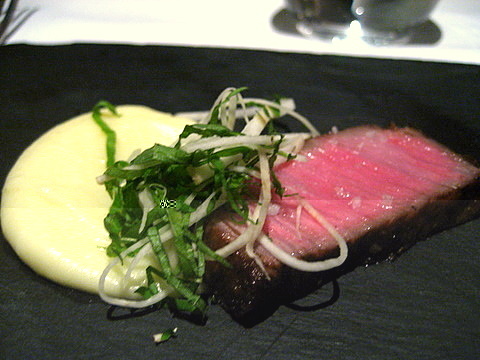 The use of shiso and celery root provided a refreshing lightness to the beef. 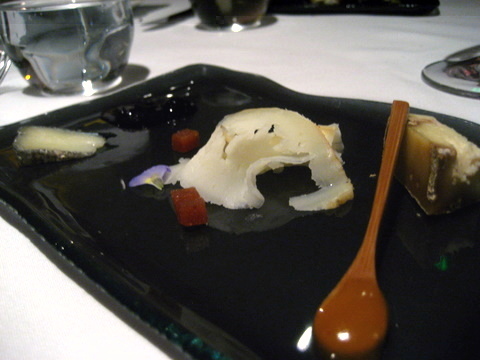 The cheese selection was fairly mild and very approachable, perhaps reflecting our host's preferences. Overall a bit of a letdown as Sona was the first time I remember having a cheese plate I truly enjoyed. Perhaps I was expecting something a bit more exotic to live up to my perception-altering first visit. With a distinct Thai flavor, I expected the ginger to dominate but instead the dish had a flat sweetness that I found a bit cloying. 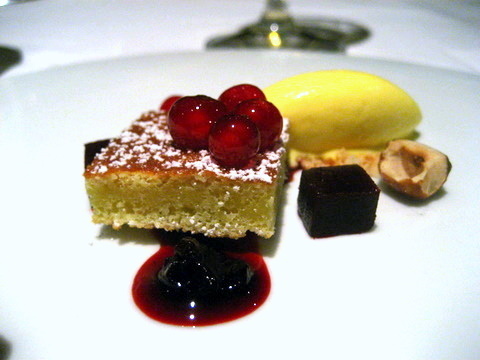 The saffron ice cream was easily the standout flavor of the dish exotic and slightly sweet it contrasted nicely with the sharp tang of the currant and the smooth buttery flavor of the cake. Chocolate mousse and Roquefort cheese sounds like a daring combination but it actually worked much better than I expected. The dark opulent chocolate is the dominant flavor. 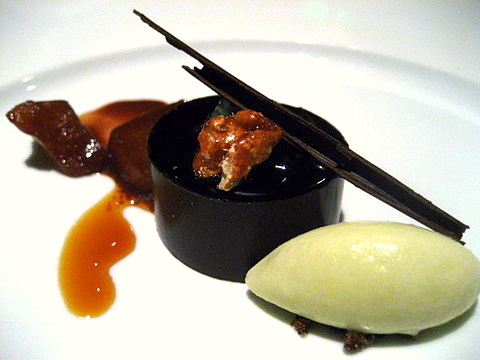 The ice cram had some of the characteristic Roquefort character but mainly added a general savoriness to the mousse. 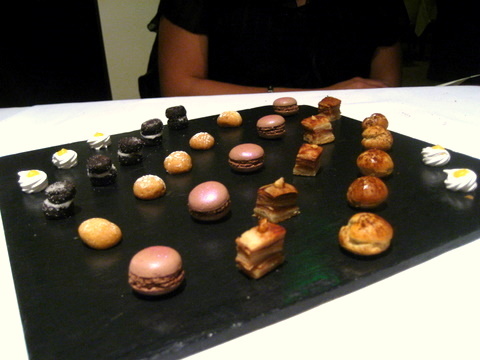 This was one of the most varied and distinctive presentations of mignardises I have had in a while. From left to right: lemon meringues, mini Oreos, powdered sugar-covered almond sandies, chocolate cherry macarons, apple "lasagnas," puff pastries, and caramel/cocoa "pat de jeis"
At the end of the meal our server came and asked if we were full. Somehow the group decided we weren't quite full so the kitchen decided to whip up one last course for us. 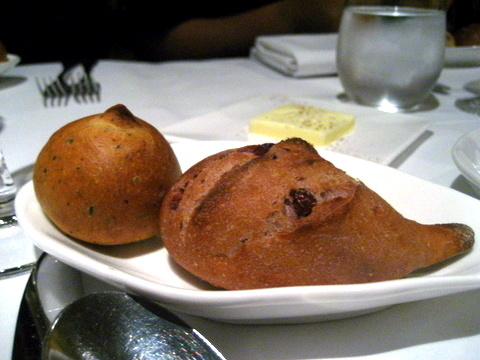 This was particularly generous as the entire kitchen staff had gone home except for Executive Pastry Chef Ramon Perez. This was probably the largest course of the night, maybe the kitchen wanted to make sure we didn't ask for anything else. 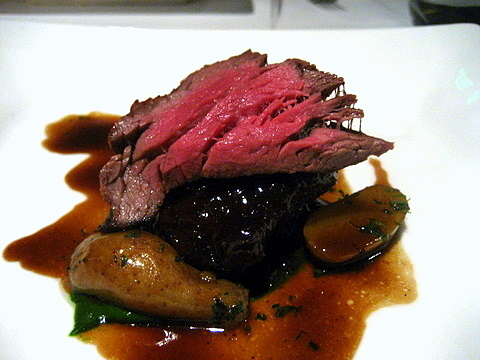 Chef Perez showed his skills with the savories, whipping up a very pure simple tenderloin and rich braised short rib. The staff seemed to pay particular attention to our table, understandable as my friend reserved the restaurant's private dining room. Overall the service was outstanding except for a minor gaffe when one of the diners asked for an Americano and got a Café Americano instead of the cocktail. I recall during our first visit Chef Meyers came out to talk with us a number of times and even posed for photos with us at the end of the meal. Since that first visit years ago, Chef Meyers has expanded his portfolio of restaurants quite rapidly, opening Comme Ca and recently Pizzeria Ortica in Orange County. Day to day, the kitchen is lead by Chef Kuniko Yagi whose meteoric rise to Chef de Cuisine is all the more impressive given her lack of formal training. Sadly neither one was in the kitchen when we went, having returned from a business trip that very evening. While the meal at Sona was quite solid it didn't reach that unforgettable level of our first visit.